Chairman Huh Chang-soo of the Federation of Korean Industries. 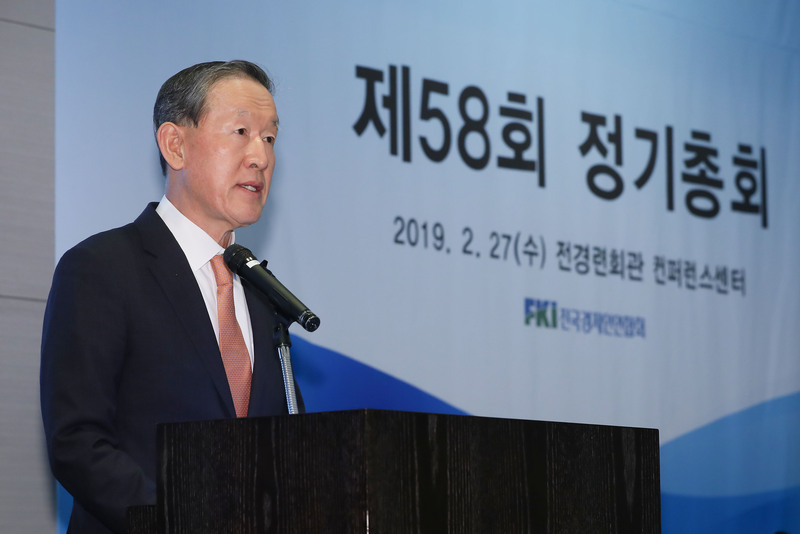 Chairman Huh Chang-soo of GS Holdings has been named to serve a 4th term as the 37th chairman of the Federation of Korean Industries (FKI) on Feb. 27. At the 58th general conference of the industrial organization held at the FKI building in Yeouido, Seoul, approved the proposal to appoint the chairman for another term to head the business lobby organization as chairman. 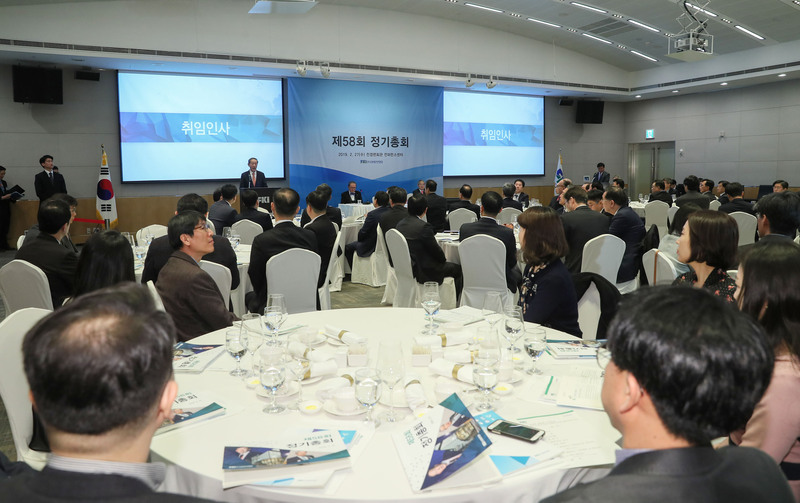 FKI said its member firms and senior advisors agreed that chairman Huh is qualified to boost FKI to another level of development and shows the way for Korea’s economy to continue to prosper. To do so, he pledged to do the utmost to entirely sever the “collusive ties” between politicians and businesses, enhance transparency of the federation’s activities and build up its functions as a think-tank. “We will also come up with a variety of ideas for national economic development by enhancing functions as a think-tank,” the chairman asserted. The Federation of Korean Industries is a non-governmental organization consisting of Korea’s major conglomerates and associated members. As an economic association established by private business sector’s voluntary basis, FKI is differentiated from other economic associations. The organization was found in 1961 with the objective of promoting sound economic policies and internationalizing the economy to further enhance the free market economic system and development of the nation. Specifically, the FKI suggests the direction of the Korean economy’s growth strategy, contributing to regulation reform, and establishing diplomatic relations at a private level through multilateral and international organizations. Per the objective of the organization, the FKI is dedicated to improving the welfare of the Korean economy. Chairman Huh Chang-soo was elected to the Chairmanship of FKI in 2011, and is also Chairman of GS Holdings Corp.
Huh is the 33rd Chairman of the Federation of Korean Industries (FKI), having taken up the position in February 2011. He is also Chairman of GS Holdings Corp. which specializes in energy, distribution, and construction. GS Holdings operates subsidiaries and affiliates such as GS Caltex Oil, GS Power, GS Retail, GS Shop, GS EPS, GS Global, and GS Engineering & Construction. Chmn. Huh assumed his current position and responsibilities as Chairman of GS as of July 2004. He has also been serving as Chairman of GS Engineering & Construction Since 2002. Huh received a degree in Business Administration from Korea University in 1972. He also graduated from the Department of Business Administration at Saint Louis Graduate School in 1977 and earned an honorary doctorate degree of law at Saint Louis University in 2007. In 2017, the chairman had to apologize to member companies for the group's involvement in the Park scandal and said he would resign from the post, but had to work another term as core members such as Samsung, Hyundai Motor, SK and LG quit the group and there were no potential candidates to replace Huh.